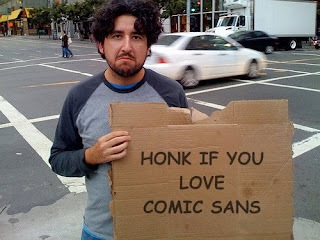 As a designer, I really don't HATE the Comic Sans font. I don't particularly care for it, but I don't share the same zeal that so many folks out there seem to. 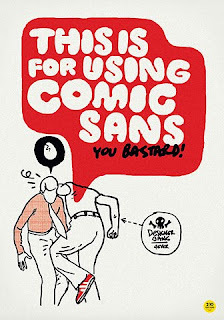 Now, COOPER is a font that I hate; don't quite know why, but anytime I see those fat lil' letters, it just make me want to PUKE! Funny story; I used to work with a woman who, for whatever reason just didn't like me. I know, crazy right?!? 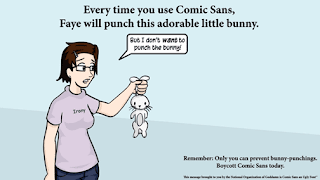 Anyway, we're sitting and talking about fonts, and I pipe in; "I cannot stand Cooper; Anyone who uses that font should be kicked in the ovaries" (I really just said that I didn't like the font, but I'm pretty sure this is what she heard.) 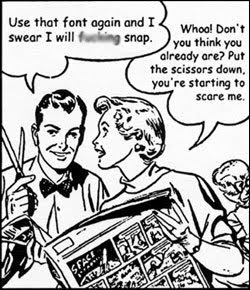 And she retorts with; "I did my whole website in Cooper". TRUE STORY! Remember that one, PB?